Phil Lynott's son watched Thin Lizzy return to the Slane stage Saturday for the first time in 30 years. 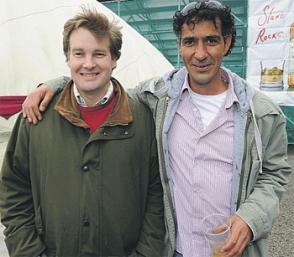 Independent.ie reports Galway-based sculptor Macdaragh Lambe (pictured above right, with friend Roderick Perceval) enjoyed his late father's reformed band from a grassy hill on front of Slane Castle with host Lord Henry Mount Charles by his side. "I wasn't here the first time my dad played 30 years ago, but seeing Thin Lizzy tonight, in this setting, with Lord Henry - it's something I am going to remember for the rest of my life," said Lambe, now 42. Born in Dublin in 1968 as a result of a relationship between his mother and the then-struggling musician Lynott, Macdaragh was given up for adoption and brought up by Oliver and Martina Lambe in Celbridge, Co Kildare. It wasn't until he was 35 that Lambe learnt he was the son of the million-selling Irish rock star who passed away in 1986.